To receive email from Megan Riley, add gardens@wncmretc.com and info@wncmretc.com to your safe sender list. Have a stack of pots from last season? Last summer and fall, I was not in touch with you as often as I like to be, but I hope for a good reason. An AmeriCorps educational allotment I earned in 2004 was about to expire so I took some time away from the daily work of my business to brush up on the science behind all that I do and improve my propagation and landscaping skills, taking several horticulture classes at Haywood Community College. I also completed the M R Gardens business plan as part of an entrepreneurship class at UNC-Asheville and planned out a greenhouse project for a Business Sustainability course at Appalachian State. My time back in school opened a deep well of thoughts about gardening, education and social entrepreneurship, and I hope to share some of that with you in upcoming newsletters. The horticulture program turned out to be a nice complement to my unconventional education in sustainable farming. While the landscaping course teaches a style quite different than what I typically do, I'm incorporating some of the concepts to enhance the aesthetics of my edible landscape designs. Read more about my background here. Please be sure to wash them thoroughly before you give them to me. This pre-wash decreases time spent sanitizing the containers and ensures that plant disease does not spread to my nursery. I greatly appreciate you helping to keep down labor costs associated with washing pots so that I can continue to offer a sliding scale. Contact me at gardens@wncmretc.com to let me know what sizes of pots you have. M R Gardens offers a Pre-season Prep service so you can pick out the plants you want to purchase before the start of the growing season. That way you can thoughtfully plan out your garden ahead of time and make sure you have enough space for all the plants—and you won't have to hunt down your favorite varieties at the last minute. Orders for summer transplants are due Monday, March 18. If you haven't already received the 2013 plant list, please request one by emailing me at gardens@wncmretc.com. Thanks to those who have already submitted your orders. Early is always better for me. This year I'm offering 40+ varieties of summer transplants: tomatoes, peppers, eggplant, tomatillos, culinary herbs and beneficial flowers. Based on your feedback, I have some varieties that I did not have last year like Conchos jalapeno peppers, a large sweet bell pepper called Olympus, three more types of Roma and plum tomatoes (for the canners among you), and a couple of classic round bright red tomatoes like Mountain Magic. I also continue to offer heirloom tomatoes specifically suited for Western North Carolina such as Ruby Orr. Seedlings are typically sold in 3-in. containers. Photographs of some of the plants and produce can be viewed on the M R Gardens Facebook page. Click on the photograph to view the caption, which usually mentions the variety. 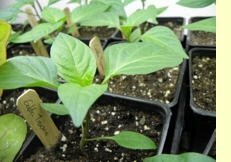 For now, I’m focusing on selling the vegetable seedlings that absolutely have to be grown as transplants while encouraging customers to direct seed crops that do just as well when sewn right into the garden. I'll be in touch in a couple of weeks with details about a special I'm offering on a direct seeding tutorial as part of my garden coaching service. Growing space is limited so please order as soon as possible to reserve your plants. I look forward to helping you create a bountiful backyard this summer. "It takes a village to start a small business." This phrase crossed my mind many times in the last year. I've been very grateful for how excited people are when I tell them about M R Gardens, and incredibly thankful for the way friends, family, neighbors and customers have supported me. Even if each of their contributions were small, collectively they were huge. Forgave me when things didn't go perfectly. For many years I've had the joy of helping others achieve their dreams, so to take all of this assistance has been quite humbling at times. But I would remind myself of the vision of my business—it is improving the well-being of community members as well as the health and beauty of our land—and let myself accept what was offered to me. The most humbling part is that I'm still just getting started, even though I've been taking baby steps since 2009 to open! I have at least one more year of intense start-up activities before I'll feel like I'm functioning at a satisfactory level. And even then, I anticipate growth will always keep me adding, adapting and improving. So the moral of the story is: "HappyThankYouMorePlease," as the title of the film says (a movie I highly recommend, by the way). In the upcoming year and beyond I will offer more opportunities for you to be involved with, and hopefully gain from, the building of M R Gardens. (Look for announcements about Working-for-Produce-Plants-or-Education in future newsletters). Thank you, I truly appreciate your support, and I hope to see more of you. This winter I did not have time to do as much season extension in my garden as I like to, so this past month, as my last turnip, beet and radish left my fridge and into my belly, I've actually had to buy produce. (Gasp!) It's something I rarely do anymore. I definitely noticed the increase in my grocery bill, and it reminded me that once a garden system is set up, it does indeed save money in groceries. That said, at the beginning stages of gardening, the upfront investment can feel intimidating. If you do the math of all the tools, soil amendments, plant materials and other supplies, you may be hesitant to start your project. But that simplistic way of looking at the investment doesn't account for all that gardening brings to your life. 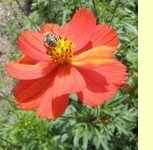 Here's an article from the blog archives that expresses how gardening brings so much more to a gardener's life than just savings on the grocery bill.